There are more first-generation college students than any time in history, and many of those students come from families with more modest income. In part 1 of a two-part story, GlobeSt.com speaks with Pierce’s Fred Pierce about how the sector is reacting to this shift. 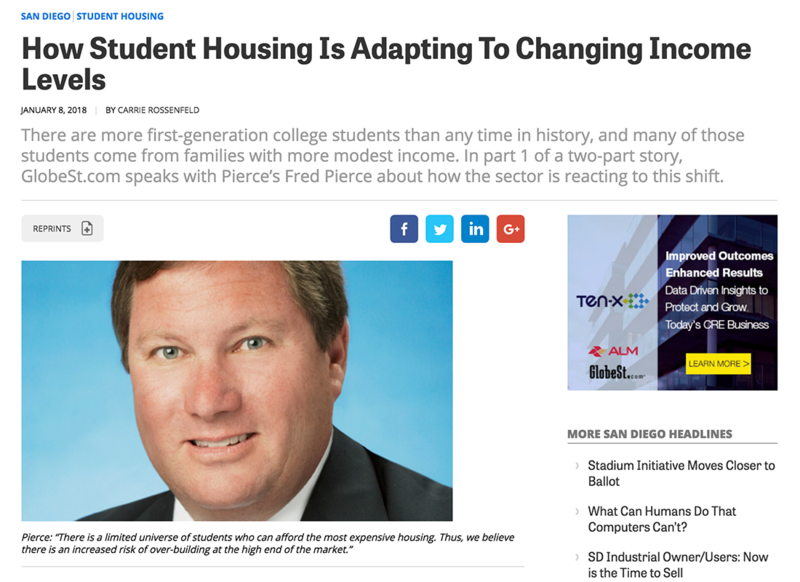 SAN DIEGO—There are more first-generation college students than any time in history, and many of those students come from families with more modest income, Pierce Education Properties’ CEO and president Fred Pierce tells GlobeSt.com. Pierce Education Properties has become the 14th-largest owner of student housing in the country, as well as the 19th-largest property manager in the industry, ranking among the top-25 owners of student housing in all eight years that Student Housing Business Magazine has published its rankings. In part 1 of a two-part story, GlobeSt.com speaks with Pierce about how the student-housing sector is reacting to this shift. Stay tuned for part 2 of our interview with Pierce, coming up on GlobeSt.com.